The Canadian Comfort and Remembrance Program is a tangible demonstration of the appreciation felt by Canadians for Canadian Forces Personnel who suffer a very serious injury, and for next-of-kin who have lost a loved one on deployed operations. Debbie Schmidt, one of our guild members has taken on the task of motivating, co-ordinating and communicating with the Canadian Comfort and Remembrance Program for the members of our guild who wish to contribute and take part in the project. Abbotsford Quilters’ Guild is one of many guilds and groups in Canada who contribute to this Project . 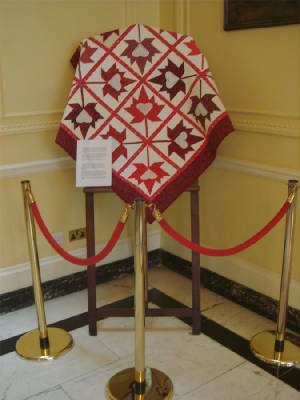 Our recently completed quilt was chosen as the CCRP display at Canada House in London, England. We are very Proud and Happy to share the photos that have been provided for our members and visitors to our page. Below is a message we received with the pictures of “Our” quilt on display. 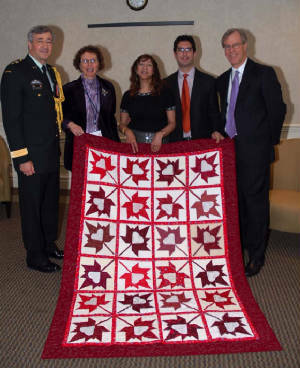 On behalf of the Canadian High Commission in London, we would like to thank you, Mrs. Debbie Schmidt, and members of the Canadian Comfort and Remembrance Program, for sharing your quilting initiative with us. 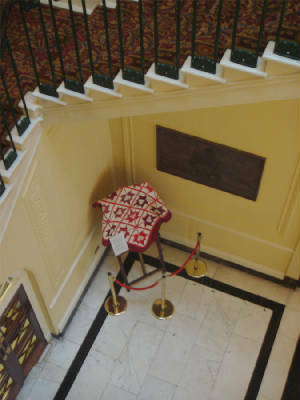 The quilt is currently being displayed prominently in Canada House, where both mission staff and scores of visitors have admired the quilt and commented on its significance. As Canadian Forces are working alongside their UK colleagues in some of the most challenging of conditions in Afghanistan, the quilt is especially fitting for this location, here in the heart of London.